DUMBARTON gave a spirited performance but suffered a narrow defeat away to full-time St Mirren in front of a 2,792 crowd. Stevie Aitken's team was weakened by the absence of strikers Garry Fleming and Christian Nade, with Jordan Kirkpatrick taking over upfront. He put in a power of work, but could not find the net. There were chances at both ends in a tight, competitive opening 45 minutes. 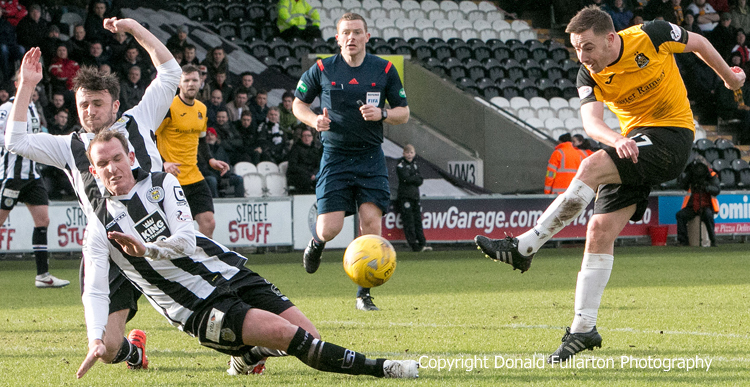 Ex-Sons midfielder Scott Agnew had the ball in the net for St Mirren from a corner on 28 minutes, but the referee had already blown for a foul. Moments later Buddies keeper Jamie Langfield and his defence just managed to keep out a powerful header from Frazer Wright. Jon Routledge (pictured) also came close. After the break both teams came out looking even more determined for a breakthrough, with Saints moving an extra man into attack. Dumbarton had quite a lot of possession, but it was St Mirren who opened the scoring when Lawrence Shankland fired home past comeback keeper Mark Brown from a sharp angle on 63 minutes. Tom Walsh, who was outstanding all afternoon, Grant Gallagher and Wright again all came close. But St Mirren held on fairly comfortably to take the three points.